The first volume of Norwegian biographer Ivo De Figueiredo’s life of Ibsen, Henrik Ibsen. Mennesket appeared in 2006; the second volume, Henrik Ibsen. 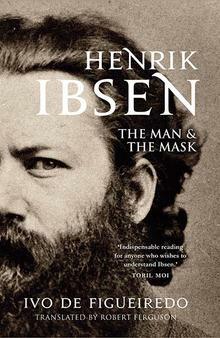 Masken, followed in 2007, and the one-volume abridgement, Henrik Ibsen. Mennesket og masken, came later in 2010, and that abridgement, miraculously, now appears in a 700-page English-language translation by Robert Ferguson, a stately brick of a thing from Yale University Press that presents for English-only readers what is certainly the most lauded and complex life of Ibsen since Michael Meyer’s book nearly 50 years ago. De Figueiredo is a wonderfully sympathetic chronicler of what is an almost unrelievedly somber, angry, and thwarted story, and translator Ferguson’s English translation is a marvel of fluidity - it takes a good deal of skill to make an enormous biography of Henrik Ibsen, of all people, page-turningly readable, but “The Man and the Mask” never flags at any point in its generous length. Ibsen was a poet before he became a dramatist, and he remained a poet long after he had committed himself to the theatre. It was here that his talent was most obviously visible, that remarkable talent for chopping and cutting words into rhyming shapes that so impressed those around him - and possibly even impressed himself. His command of drama as a form took considerably longer to acquire. He was a writer, and a writer did not belong in church, in the society of others. His home was in the steeple, condemned for all eternity to see the world from outside, from above, to describe it, and the tragedy of human life. And to feel aways the eyes of the devil on his neck. “Henrik Ibsen’s life was a dance with angels and demons.” This biographer keeps that dance going with a surprisingly light tempo and an unerring instinct for, oddly enough, zingers - the flying summaries throughout the book are both thoughtful and aphoristic. It’s thoroughly enjoyable to have this work in English.